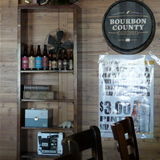 This bar/restaurant is in the obscure suburb of Franklin Park.. I have lived in Franklin Park for close to 30 years and believe me...there is not much as far as great dining and great bars. Most of the bars are taverns and dives that I would never in my life visit. Actually I thought they were embarrassing to have in the neighborhood. FINALLY...Franklin Park has a better option and a bar/restaurant that it can be proud of. I don't have any investment in this place...I am just so overjoyed that this type of place has opened in my own hometown and I don't have to drive into the city for this type of experience. This place doesn't look like much from outside. The address is 9743 Franklin Avenue in Franklin Park. Across the street from the Franklin Park Metra station and just a short drive from both OHare Airport and Rosemont. I am posting this because I know most people would never think a great upscale bar/restaurant would be situated in Franklin Park.. But they're wrong because now we have Hopscotch. On Wednesdays the bar offers specials for those who work in the RESTAURANT AND BAR INDUSTRY.. On Mondays they have specials for veterans..which is nice. This place is a great place to watch sports ....and have great camaraderie with the locals and make friends. AND IT IS NICE ENOUGH TO BRING A DATE TO. 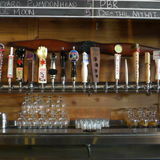 They have over 100 craft beers (Hop), as well has 24 on tap, and over 150 whiskeys (Scotch). A lot of hard to find and unusual beers. The selected whiskey shots go for $3.00. Good food too. Last edited by jane franklin on March 24th, 2015, 3:42 am, edited 29 times in total. Interesting find. Thanks for the heads up. Interesting collaboration of New Glarus and Sierra Nevada... Beer Camp Across America, There and Back at Hopscotch on tap now. Last edited by jane franklin on March 24th, 2015, 3:43 am, edited 1 time in total. I forgot to get back to this subject. I went here one Wednesday night. It is perplexing that it is so tricky to get to|from on a transit bus. It is within 1½ miles of a CTA bus route. But this part of Franklin Park is seemingly ceded to the commuter railroad. For weekday rush hours, the Pace #319 Fullerton(!) bus is extended to the Bensenville train station on this RR line. But during the hours when Hopscotch is open, you are left with three runs of this route westbound from Belmont & Cumberland: @ 3:26, 3:56, & 4:26 pm. There is no marked or protected crosswalk to the northwest corner of Belmont & Cumberland! Pick one which gets you to the SW or NE corner, and then be diligent to not cross during the segment when there are left-turning vehicles across your 2nd street. The stop here is in front of the Franklin Park post office. Cross the road and walk back east a little. It is a little easier to get here from the north or south. The Pace #303 bus runs near here, but again only Monday - Friday. Both its terminals are on the Blue Line “L”; the north @ Rosemont, and the south @ Forest Park. The last bus north is @ 10:36 pm; south is @ 10:26 pm. The beers are good. 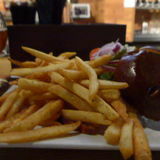 The hamburger was fairly tasty. Prices are below average. It was surprising to me that there was not much patronage here this evening. I do need to hit here again. Obviously, on another weeknight. But if you're less sacrosanct about motoring to|from here, try it whenever. Sorry to say that it looks as if Hopscotch is on it's last legs. Half the beer on the beer menu is "unavailable" and the menu is a couple items scribbled on a chalkboard. That didn't matter last night. The cook didn't show up for the beginning of their shift. 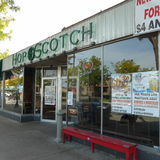 Hopscotch is no longer in business.